Decide helps you to make decisions. 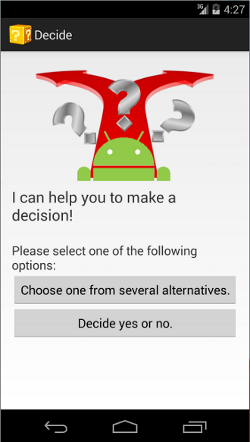 Decide is an Android application that helps you to decide on any matter. Enter your various alternatives, the factors upon which is based your decision and then give a weight to each one. The program will tell you what 'is the best decision and will assign a score to all the others. You can select to decide one from several alternatives or more simply yes or no. Type the argoment of the decision (e.g. holiday). Enter the choices from which to decide (e.g. 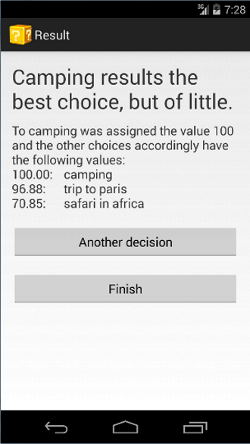 camping, safari, trip to Paris). Enter the factors to take in exam to make the decision (e.g. relax, save money, fun). Choose the most important factor and assign a weight to each other one. 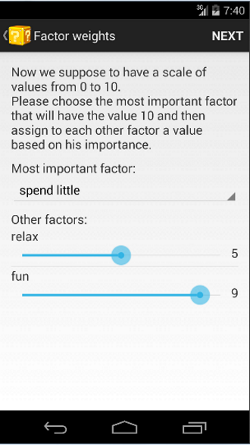 Give a value to each choice considering the different factors. As result the program tell you what's the best choice and a classification of each other. Enter the factors to take in exam to make the decision yes or no. Give a value to choices yes and no considering the different factors. As result the program tell you if is better to choose yes or no.